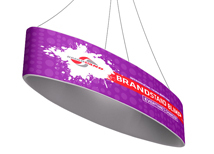 Hanging banners are the perfect solution to make your presence known at trade show. 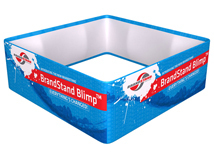 We carry products from multiple manufacturers which are very affordable and very good quality. 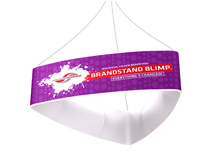 Hanging banners have always been a very expensive item in the trade show industry, but the Brandstand Blimp utilizes a dye sub graphic print from China which makes the banners very affordable. Even though the graphic comes from overseas, there is a 5 day turnaround and overnight shipping included in every price. 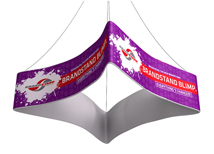 Brandstand and NWCI back up these products so you can rest assured your hanging banner will be a quality product that will last for years. 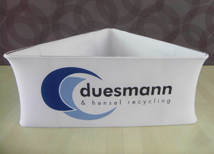 Hanging signs are a great addition to any indoor display area. 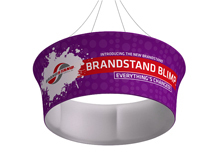 A hanging banner with an effective design will be sure to draw the crowds to your booth. 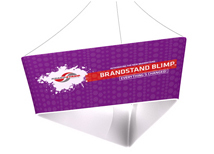 They are available in multiple sizes and two shapes so you can choose the best hanging banner for your booth. 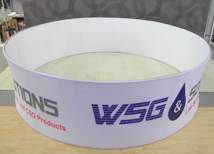 Our design team can help you design great graphics for your hanging banner that will make you stand out and get your message across to every exhibitor at the convention.